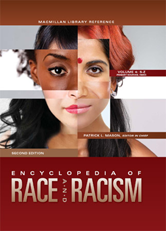 The Encyclopedia Of Race And Racism, 2nd Edition, provides critical information and context on the underlying social, economic, geographical, and political conditions that gave rise to, and continue to foster, racism. Religion, political economy, social activism, health, concepts, and constructs are explored. Given the increasingly diverse population of the United States and the rapid effects of globalization, as well as mass and social media, the issue of race in world affairs, history, and culture is of preeminent importance. Federal Recognition: What Is an Indian? Genocide and Crimes Against Humanity: Japanese Occupation Joseph L. Graves Jr. Racial Formations: Latin America Norman E. Whitten Jr.
Sports: Basketball Joseph L. Graves Jr.
Sports: Track and Field Joseph L. Graves Jr.
Theories of Athletic Performance: Boxing Joseph L. Graves, Jr.